Fashion and art is a theme relentlessly phrased and discussed. 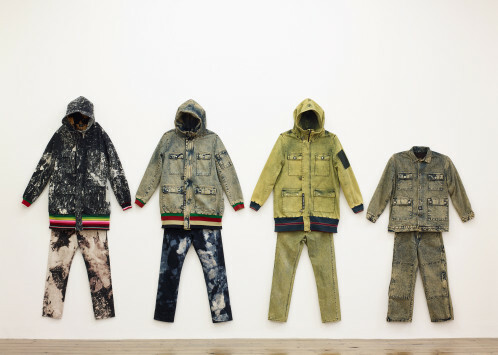 Work Wear: Garment and textile archive 2008 – 2016, Sterling Ruby’s current exhibition at Sprüth Magers London provides another investigation of the topic. The American artist is known for his multidisciplinary approach. His sources of inspiration range from psychology, hip hop culture, violence, globalization to waste and consumption. Likewise various are the media he works with: from collage and bronze to sculptures and ceramics. Ruby has a close and long-lasting relationship with fashion. Close friend to designer Raf Simons, he designed his Tokyo shop before taking part in the designing process with collaborative collections A/W 2014. 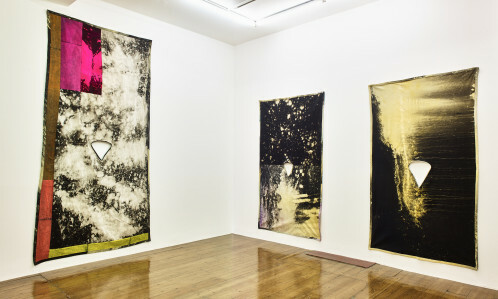 And it is also in his own practice and studio that Ruby deeply explores garments. Creating new workwear for each new work, Ruby and his studio members soon realized that each technique used – collages, bleaching, painting – reverberated on the garments. With Work Wear the American artist displays the outfit of his studio members, thus transforming them into sculptures. This practice began blurring the lines between fashion and art. The exhibition embodies Ruby’s Bauhaus approach to the artistic field that challenges high art dichotomy.